I’m not going to say it’s never happened before, but to me it’s a novelty. In its issue of April 19th 2013, the Times Literary Supplement has two consecutive reviews featuring publications specifically and only for the iPad. Here’s a worthy cause, brought to our attention by Shelf Awareness on 6 May. Click on the link to donate. Under the BookCourt plans, the main floor of the building would stock new and used books, stationery and art journals and have space to host literary events, book clubs, workshops and more. On the top floor, BookCourt will launch a writers’ residency program for as many as a dozen people. On the property, the store will build writers’ “sheds,” straw-bale houses, perhaps even yurts. 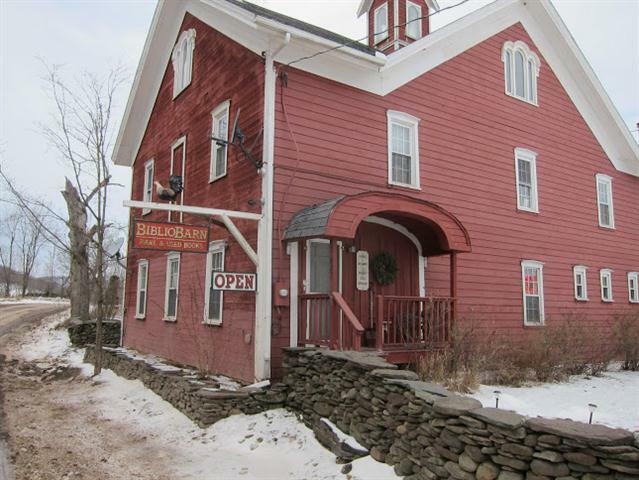 Zook, son of BookCourt founders Henry Zook and Mary Gannett, has the support of Bibliobarn owners H.L. and Linda Wilson, who founded the rare and used bookstore in 1996 and have put it up for sale. BookCourt has launched an Indiegogo campaign to raise $300,000 for the project, seeking the support of “customers, writers, friends and book lovers around the world.” Some $260,000 would go to purchase the property and the rest will be used for renovations, inventory and writers’ housing. Zook and BookCourt manager Andrew Unger have also created a 15-minute campaign movie. This hit Reddit recently. 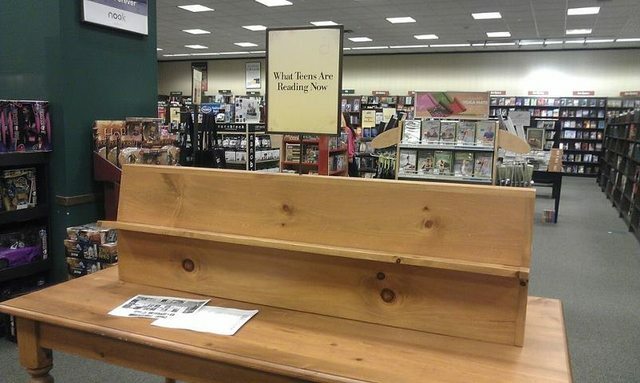 (Of course Barnes & Noble are just restocking the table, not making a sarcastic comment.) 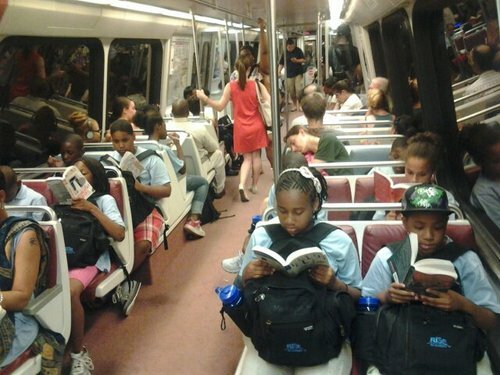 Look at all these kids read on the train. He continues “The judges are currently in session to decide this year’s Kate Adie Prize for the Year’s Most Unoriginal Book Title. Ms. Adie gamely accepted the naming of the prize after her memoir, The Kindness of Strangers.” This year’s contenders for the Adie Prize include Another Country, Flesh and Blood, and The Sea Change. He finishes his piece with an exciting announcement: “Meanwhile, the elders in the Basement are setting up a new award, the All Must Have Prizes Prize, established to ensure that no book is published without winning a prize.” Maybe this blog can live in hope. We certainly have so many book prizes that making fun of the idea is not inappropriate. Book Prize Information tracks 33, but they are hardly scratching the surface. Wikipedia does a bit better, listing too many to count, and at that only including those which have a separate Wikipedia article. Almost inevitably Amazon offers to sell you prize-winning books from many awards. The New York Times provides a list of the winners of National Book Awards from 1950 to 2005: maybe they’ve updated it since then. But you are already overwhelmed by the number of books screaming for your attention — and we have thus far ignored the massive universe of academic book prizes and awards. Wikipedia lists the Bancroft Prize under American Literature, but not under history, and while I confess that I haven’t tooth-combed their list, I don’t think it includes the prizes of the Association for Asian Studies or The American Political Science Association, to name but two of the hundreds (?) of academic associations which give prizes in their own subject area. And this leaves out their regional and subject sub-category prizes, as well as this one in which Elsevier reports on several prizes for just textbooks! Why do we have book prizes? Probably mainly to flatter the recipients and the publishers of their works. There is a belief that people do buy books because of prizes. It’s hard to know for sure, as any bump in sales might be attributable to the fact that a book was (self-evidently one might argue) a good book rather than because it was a prize-winning book. However, publicity is always good, and can be assumed to increase sales. The Pulitzer Prize, the Booker Prize, the National Book Awards, and to reach for the stars, the Nobel Prize, all endorse some sort of quality, and can probably be counted on the boost sales. Being on the short list for a prize has less of an effect, often an undetectable effect. Last year’s failure to declare a winner in the Pulitzer fiction category led to an outbreak of analysis about whether or not sales were thereby being damaged. Here are links to Publishers Weekly, The Guardian and The Bookseller (with a report of a debate at the Society of Young Publishers of which I was at one time a member). Just announced is the Diagram Prize for the Oddest Title of the Year. Melville House’s book How to Sharpen Pencils lost out to Goblinproofing one’s Chicken Coop: their blog has a post about it. Wikipedia gives us a listing of past winners. Just like the Bulwer-Lytton Prize, this one seems a bit like shooting fish in a barrel. Those of us who toil in academic publishing are bombarded by odd sounding titles, and it almost seems unfair to award the prize to an academic book as has been done on a few of occasions. Of course all too many academic writers lay themselves open for consideration for the Diagram or the Bulwer-Lytton — jargon, while never desirable in and of itself, is often forgivable in the interest of clear communication between people involved in the same specialized research area. We all just love The History and Social Influence of the Potato, and I expect Redcliffe Salaman was a not altogether innocent participant in setting up the punch-line title. There have been odder, but this one I like best. I’ve got to stop this — here comes the announcement of the Edgar winners from the Mystery Writers of America. My first boss told me to feel free to take time off to get my hair cut — “after all, it grows during office hours”. Nice but not necessarily good, I guess. But certainly not a bad boss — I learnt a lot from him. And that may actually be the most important qualification for getting into the category “Good Boss”. His father had worked for Longmans for years, so I had vicarious access to years of tradition, something which used somehow to mean much. One manuscript I worked on for my next boss was a translation of a French anthropology text — both areas in which I had some qualification. I spent quite a long time improving the translation, but ultimately schedule demands took over and I had to hurry up. Years later I came upon a letter from my boss to the translator, an academic of course, who had complained that the editing of the last part of the book was markedly less thorough than the earlier part. My boss said he’d spoken to the person responsible (a terminological inexactitude, I fear) and that such a travesty would never happen again. I’d never have known if we hadn’t had a fool-proof filing system: and as far as I’m concerned I’d probably have been better off. During these years, at salary review time, we all used to be addressed one-on-one by the tippy-topmost boss. One year he told me something along the lines of Well, I never expected I’d have to be talking to you again. I thought you’d have taken the hint and left. I replied “You keep paying me, I keep turning up”: they did; I did. I once had a special relationship with a boss based upon my having had an editorial background, which he also had and valued hugely. I was favored. This was nice for me, but was not good management. One giveaway for a bad boss (in my book at least) is a demand for punctilious receipt collection for trivial expenditures. This always sounded like my boss saying “I always cheat on my expenses, and am open to kick-backs, and thus I know you are too — so show me the proof that you are not on the take”. This is not calculated to inspire me to greater effort. I once had a boss who’s attitude to her male employees was based upon the extent to which they would flirt with her. I wouldn’t, and in consequence was not highly regarded. Once, after yet another dispute with a senior colleague, I was hauled up before my boss who concluded “You certainly don’t suffer fools gladly”. I replied “I wouldn’t have to if you didn’t keep hiring them”. That he didn’t reprimand me must I guess qualify as bad bossing. I’ve reported to people in finance and in inventory management — and, for me, this has worked out well. The different perspective provides valuable knowledge if the boss is self-confident enough to recognize that not only are there things they can teach you, but also things you can teach them. We all know to say cost containment is important, and keeping books in stock is vital, but working in a department where one of these is the number one priority, makes it all real and forces you to internalize these attitudes. One of my bosses made me do gross margin calculations in my head. It was hard work initially, but I actually got pretty good at it — and the ability to figure out percentages in my head has stood me in good stead, even if we now have computers that solve such equations, which I have programmed up quite a few times. One of my bosses, probably the smartest person I’ve ever worked for, was extremely excitable. I spent a lot of time “talking him down”. He’d thump the desk, scream, get red in the face, waving his arms about. My job was to speak calmly (and loudly, so I’d be heard over his shouting) and bring him back down to earth and the point under discussion. I saw myself as the cushion between him and rest of the company. Once he started shouting at one of my people: I pulled him aside and said that he paid me to be the recipient of his rants, and that he should be shouting at me not at my staff. He acknowledged that that was indeed the case, and we never had that problem again. From him I learned financial rigor. He’d shout “Don’t say ‘a lot’. Give me a number.” and this I learned to do. Working for him was hard work, but this was probably the most rewarding job I ever had. Probably the biggest no-no in managing people is being seen not to be supportive. You are managing people, and people have feelings. Total loyalty to your staff in dealings other departments is a requirement. Take it on the chin; you are after all the one who’s paid to be ultimately responsible. Do not slither and shift blame to anyone else. Eat it up; then tell the person off in private. Dressing down an employee in front of their direct reports is utterly irresponsible, especially if the subject matter is some tiny detail — how do you think someone is going to feel when the people they are meant to manage have just seen them being humiliated. There’s not a football manager who thinks that bad-mouthing individuals is a good way to encourage team work. Empathy is a job requirement. I think a boss who frequently tells you what a good boss he is, is probably rewriting history. Handsome is as handsome does: let others make this claim for you. If he ever buys another copy, the author will be surprised to find his corrections have been magically made. However, why did he ever sell this copy? GIF was Oxford Dictionaries word of the year for 2012 — sort of passed me by I confess. Helpfully the OED tells me that it’s an acronym for Graphics Interchange Format. Their first usage quotation is from 1987 from a report announcing that Compuserve Inc. had invented the thing. Their most recent, from 2003, advises against overusing them on the grounds that too many seen at one time can be jarring — something the designers of some of the examples might have paid attention to — e.g. this one. The one below, from the story in Publishing Perspectives is plenty jarring — in fact it’s driving me wild. The words frivolous and silly which keep coming up as it rotates seem entirely apt. It’s something of a relief that it appears stationary here. Click on it and it’ll rotate annoyingly, or enjoy it in the Publishing Perspectives story. The example in the Publishing Perspectives link showing the gymnast endlessly repeating the same maneuver does indicate a positive use for GIFs (which the OED allows you can also spell gif, though there we get into a wee bit of conflict with the old-fashioned, rather Scottish, alternative to if). By showing what the gymnast was actually doing the writer was able to communicate his critique much more fully than words could have done. One could see how GIFs could enhance ebooks in some useful ways. The PBS video on the Publishing Perspectives post, just below the annoying typing cat, provides some fascinating detail, and also engages with the disputed pronunciation — gif with a hard “g” or jif as in jiffy. Either way I suspect OUP chose it as word of the year just to show that in spite of being so old we are jolly modern.